Personalized Learning Provides the Attention Your Child Deserves. We live in an amazing time when we can tailor just about anything to fit our needs, whether it's the food we eat, the vehicles we drive, or the homes we live in. But have you ever thought about giving your child a quality education tailored to his or her needs, talents, and interests? It's possible with K12's personalized online learning program. K12-powered online schools offer personalized learning for students in kindergarten to high school. For nearly two decades, this personalized approach has helped students make the most of their potential through engaging, rigorous curriculum with the caring teacher support parents want for their children's growth. How can Personalized Learning Help Your Student? Not all children succeed with a one-size-fits-all education experience. Personalized learning can target a student's strengths and let them explore and grow further in those subjects while giving helpful attention to areas that require more support. The key is using quality academic assessments early in the school year, which help our teachers know where each student is in their education journey. Teachers then provide an Individualized Learning Plan that maps out a path to keep students on track academically. Over the years, we have developed programs with schools that offer personalized learning that can help students gain skills, confidence, and independence. How does the Personalized Learning Program at K12-powered Online Schools Work?
. Virtual Academies are statewide and offer the K12 curriculum, state-certified teachers, online clubs, and opportunities for students to socialize.
. Destinations Career Academies offer high school students traditional academic courses and electives that let them explore in-demand careers.
. Insight Schools provide targeted academic, social, and emotional support to help students overcome obstacles for a successful future.
. Blended Schools combine online learning from home and at an onsite location with in-person support from teachers.
. K12 International Academy offers a well-rounded, online education with K12's curriculum, teacher support, college counselors, and scholarship opportunities.
. The Keystone School gives students maximum flexibility with teacher support when needed. 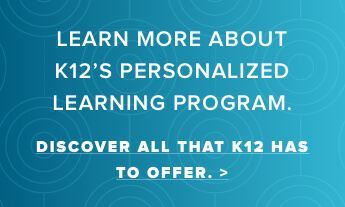 If you want to develop your own personalized learning program for your student or need to add to the existing homeschool curriculum, K12 offers individual courses for purchase, from pre-K to 12th grade. You'll find online core courses, world languages, high school electives, and supplementary programs. *Courses and course materials vary by school. Please check with your school for its current offerings. **Families do not pay tuition for a student to attend a K12-powered online public school. Common household items and office supplies like printer ink and paper are not provided. Our enrollment consultants can help address your technological and computer questions and needs.